Help conserve resources and enjoy a more efficient-running home with natural gas.Natural gas is the cleanest fossil fuel and a highly efficient form of energy. Natural gas has many advantages over other fuels. It has fewer impurities, is less chemically complex, and its combustion results in less pollution. 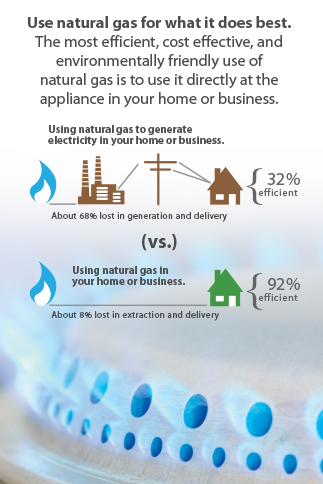 You may already be familiar with the many benefits of natural gas. Natural Gas is one of the most affordable form of energy available to the residential consumer. According to the DOE, natural gas costs approximately 68% less than the cost of electricity, per BTU. If you are looking to save on your energy bills, look no further. Natural gas provides the best energy value costing less than electricity, propane and heating oil.Beyond monthly energy savings, natural gas appliances usually boast longer life spans (up to 20 years! ), as well as top-of-the line features and technologies. Convenient – busy lifestyles demand appliances that not only are highly efficient but also can save you time. With natural gas, you can have an endless supply of hot water, precise temperature control for cooking, and faster drying time for your laundry.Every household can make a difference. Did you know that when just one home switches their non-gas water heater to natural gas, it eliminates 3,000 pounds of carbon dioxide from the atmosphere every year.